Take an ordinary sum, shake it up, add some spice and you’ve got the ingredients for our new, evolving maths series! Activity sheet 1 features word problems with a difference and accompanies the first activity, below. Activity sheet 2, ‘Interview with a number’ will get children thinking about numbers in a different way. Their challenge is to guess which number is being interviewed! 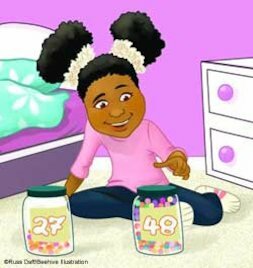 Although this is a tongue in cheek activity, it encourages children to think about the properties of numbers at a deeper level, discuss other numbers and perform some research. Maths schemes of work and cookery books are very much alike. They tell you what ingredients you need, how to mix them together and how long to cook them for. If you follow the recipe to the letter then you’re guaranteed a perfect meal. Recipes are fine in themselves but they often need a little twist here and there to personalise them. As educational ‘chefs’ it’s our job to add new flavours and garnishes to spice things up for children so that we encourage them to think about what they are ‘eating’ and to be maths critics. Our broad curriculum means that much of teaching parallels a fast food experience. Children pour into the classroom, we serve the food, they pile it in, we clean up the mess and we all move onto the next course (activity) before we’ve had a chance to draw breath. Learning doesn’t have to be this way. We can extend activities by taking some basic ingredients, adapting them, and presenting them differently to excite children’s mathematical taste buds. Collecting and extending the range of information about a simple sum is called ‘milking the maths’ – exploiting the potential in a maths moment so that there are no missed opportunities and deepening the experience for all children. Our new ‘Milking maths’ series is about evolving ordinary numbers or shapes and customising them into something special. This month, the focus is word problems.